today. Then, there are the web apps of all the different browsers, including Internet Explorer, Firefox, and Chrome, Flash and Silverlight web technologies, as well as enterprise apps, such as SAP, Siebel, and PeopleSoft, and the good old mainframe with the green screen and terminal emulators. All of these apps can be published via Citrix/VDI. UiPath is providing the first 100% accurate, extremely fast screen scraping tool. Extracts screen text from running apps. For Citrix or virtualized applications. Including Java, .Net, Flash, PDF, Browsers, Legacy, Citrix, SAP, and Siebel. Get structured data across multiple pages. Apply screen scraping to automate processes. Proven technology used on millions of computers. Delivers in under 16 milliseconds. Screen scraping comes to the rescue in many business scenarios. All too often, the only way to retrieve your data is by scraping the UI of another app. Even if you have access to the database, it is sometimes more convenient and less error-prone to go directly through the user interface. Since 2004, UiPath has been used by more than 1,000 companies for document management and imaging, enterprise application integration, content migration, desktop analytics, business IT process automation, application integration, legacy modernization solutions, mobile enablement of desktop apps, and medical record scraping. UiPath Studio gives you a full-featured integrated development environment (IDE) that enables you to visually design an automation workflow with a drag-and-drop editor. Hundreds of predefined automation blocks are available. The Recorder lets you capture the steps of a manual task, and during this recording, your actions on the screen are observed and translated into logical steps in a workflow. At the same time, the Screen Scraper Wizard and the Web Scraping Wizard allow you to get the data out of any application in mere minutes. UiPath has pioneered the screen scraping of running desktop apps with 100% accuracy in under 16 milliseconds. Prior to UiPath, screen scraping had a low accuracy rate and was slow and fragile. 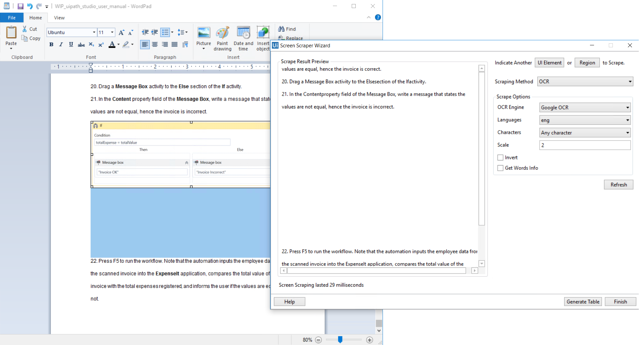 UiPath features an innovative technique for extracting text from running apps, even if they are hidden or covered by another app. Web scraping is a prime feature of the screen-scraping landscape, as there are dedicated methods for extracting pattern-based data that span on multiple web pages. 100% accurate screen scraper for Win32, MS Office, Winforms, Java, WPF, HTML, PDF, Flash, Silverlight, Console & Green Screen, SAP GUI, Siebel, Oracle apps, and x32 and x64 apps. 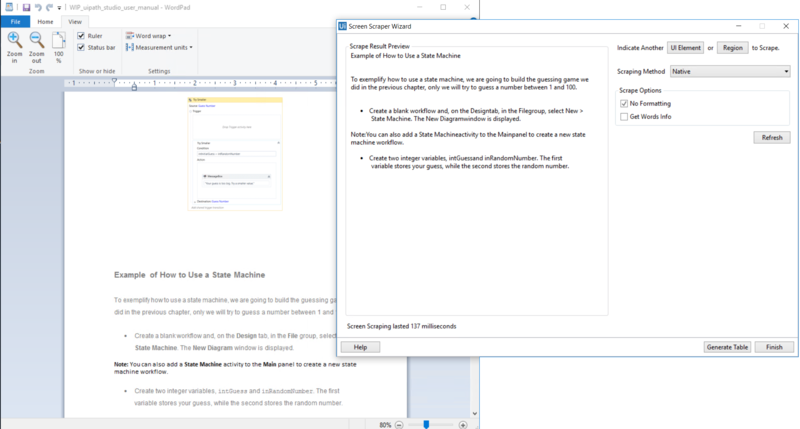 95% accurate Screen OCR engine for Citrix and Remote desktop apps. Precise GUI automation at the level of objects for replaying mouse and data entry. Fast scraping with a typical duration of fewer than 16 milliseconds. The leading and most reliable screen-scrape library available, regularly performing one million screen scrapes without errors. Powerful wizards get you started and generate code for your app in minutes. We take pride in our screen-scraping library, as we were one of the trailblazers in this area. Now, UiPath is recognized for creating the best library, worldwide. Nine years ago, we began with a single feature that allowed very fast and 100% accurate text capture from Win32 apps, and we have continuously evolved this heritage, extending its scope to new technologies. We offer the industry's most comprehensive set of options that will enable you to control how you drive the UI of other apps.